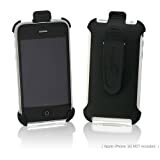 Please help me find a Apple iPhone 3gs Holster! What I want is for the iPhone to face inward, to protect the screen. That’s what I had for my 755p and I really liked that. Any suggestions? I’ve only found one and it doesn’t look like it has a clip at the top, not sure how it rotates without phone falling out. Honestly, I’m tempted to get a heat gun and make it a little bigger at the bottom so it’ll fit face forward. I just don’t know how much more fragile that will make the plastic. Plus, there isn’t anything soft on the plastic to protect the screen. UPDATE: This is the Seidio iPhone case and clip that I got. http://GarySaid.com/apple-iphone-3gs-holster/ generated Friday, April 26th 2019 at 6:04:29 am EDT (in 93 queries in 0.644 seconds).